Monaco's latest patch is trying something unusual - rather than only adding more content, the creators are cutting frustrating segments. We're used to two kinds of game updates - the standard boring patches to fix bugs, and the exciting updates that bring new content to our games. 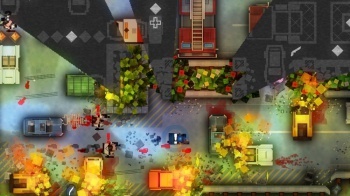 However, Pocketwatch Games is trying something different - the latest update to co-op stealth-fest Monaco actually removes several parts of the campaign. Wait, wait, don't reach for the torches and pitchforks just yet. This is actually a good thing, as the developers hope that leveling out the difficulty curve will help more people stick with the game. "The Architect's Patch" is essentially a Director's Cut version of Monaco, going back through the game's two parallel campaigns and refining them - even if that means "unflinchingly slashing" large segments of some levels. The folks at Pocketwatch realized that this was necessary when they saw that 90% of players who finish Monaco's first level don't make it to the end of the first campaign - and only about 2% make it to the end of the second. "We want more people to finish the campaigns," explains Monaco designer Andy Schatz, "and we also personally kinda hate some of the levels. Certain areas feel redundant, certain levels feel tedious." Given that Monaco has dozens of hours of gameplay between Level One and its two fantastic twist endings, the developers aren't too bummed about cutting a few minutes of frustrating gameplay here and there. Every level has had some redesigns, and new gameplay elements (namely, key-doors and mobile NPCs with items to steal) have been incorporated into both campaigns. Traditionalists are still able to access the "classic" levels, but the designers think that these new versions will provide a better experience. If you haven't paid a visit to Monaco, now seems to be the perfect time. The game is currently 80% off as part of Steam's winter sale, so there's no time to lose - get thieving!